Hand Made, Hand Painted Leather Stuff. Create Your Own Art Bag (new)! 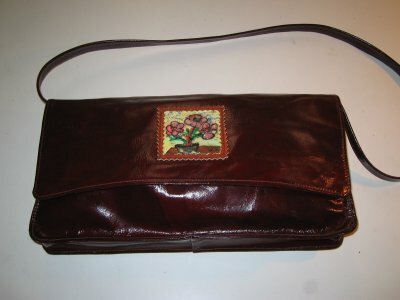 Not for sale Dark brown soft all leather envelope bag with a 31" shoulder strap. Bag has two interior sections with an additional small pocket and two magnetic closures. A small original painting of potted flowers is on the front flap.